Delmonico steak originated in the 19th century at Delmonico's Restaurant in Manhattan. Although the name is used for several different cuts of beef, Delmonico steak is often a ribeye. It is tender and more marbled than other steaks, sold boneless or bone-in. Cooking the steak with the bone makes it more flavorful and moist than the boneless steak. Like other tender steaks, Delmonico benefits from cooking with dry heat, on a grill, in the oven or in a skillet. A traditional garnish is a pat of maitre d'hotel butter -- butter mixed with lemon juice and chopped parsley. Let the steak sit at room temperature, covered, for 1 hour. Preheat the skillet over high heat. Rub the steaks lightly with olive oil and season them generously with salt and pepper on both sides. Put a thin film of olive oil in the skillet. Cook the steaks for 6 minutes per side, then test the temperature in the largest one. Cook the steak to 140 degrees Fahrenheit for medium rare or 145 degrees for medium. If the steaks aren't at the correct temperature after 12 minutes, cook them for a few minutes longer, up to 4 more minutes. Put the steaks on a platter and cover loosely with foil. Let the steaks rest for 5 minutes before serving. Measure the temperature by inserting the thermometer through the side of the steak into the center. 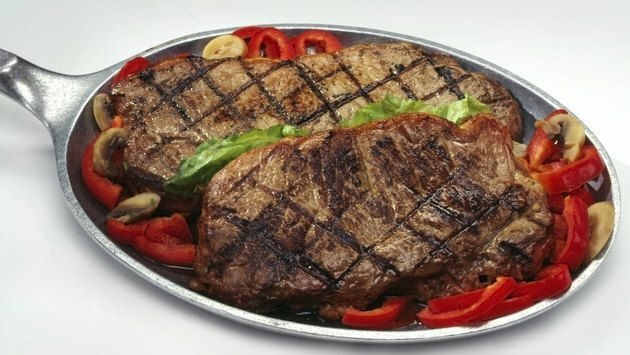 Cooking meat to 140 degrees Fahrenheit and then allowing it to rest for five minutes, during which time the heat will continue to rise another few degrees, makes it safer to eat beef that is rare or medium. Holding meat at 140 degrees or higher for 3-1/2 minutes kills microorganisms that can cause food poisoning.